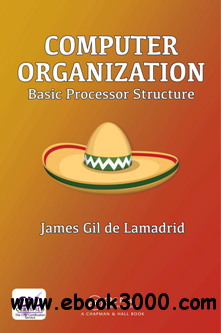 Computer Organization: Basic Processor Structure is a class-tested textbook, based on the author's decades of teaching the topic to undergraduate and beginning graduate students. The main questions the book tries to answer are: how is a processor structured, and how does the processor function, in a general-purpose computer? The book begins with a discussion of the interaction between hardware and software, and takes the reader through the process of getting a program to run. It starts with creating the software, compiling and assembling the software, loading it into memory, and running it. It then briefly explains how executing instructions results in operations in digit circuitry. The book next presents the mathematical basics required in the rest of the book, particularly, Boolean algebra, and the binary number system. The basics of digital circuitry are discussed next, including the basics of combinatorial circuits and sequential circuits. The bus communication architecture, used in many computer systems, is also explored, along with a brief discussion on interfacing with peripheral devices. The first part of the book finishes with an overview of the RTL level of circuitry, along with a detailed discussion of machine language. The second half of the book covers how to design a processor, and a relatively simple register-implicit machine is designed. ALSU design and computer arithmetic are discussed next, and the final two chapters discuss micro-controlled processors and a few advanced topics.